The new ambiance linear wall mount electric fireplace introduces the latest technology and realism for a stunning addition in the home. This series comes in three convenient sizes starting at 43" up to an impressive 95" for a perfect fit in an room. 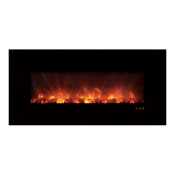 This sleek, contemporary design paired with lifelike dancing flames offer an easy and economical way to bring a room to life with an effortless do it yourself installation. 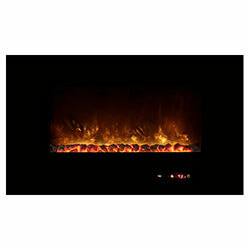 Simply hang on any wall and plug in for year round enjoyment and warmth. 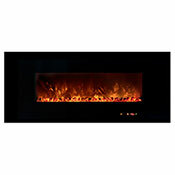 Whether you are looking to add a little heat in the bedroom or make a statement in the living room, this fully featured electric fireplace will satisfy your desire. Fireplace Weight - N/A lbs. In the unlikely event of a problem occurring due to a manufacturing fault within 24 months from the date of purchase of the appliance, parts will be supplied for repair of the product or the product will be replaced free of charge. 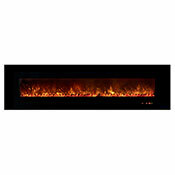 Repair or replacement is at the option of Modern Flames. Defects must be brought to the attention of Modern Flames Technical Service Department by contacting Modern Flames at 877-268-9353 or 3423 E Atlanta Ave, Phoenix AZ 85040. Please have proof of purchase, catalogue/ model and serial numbers available when calling. Limited warranty requires a proof of purchase of the product. This warranty does not cover consumable items such as the bulbs and fuses which have a limited lifespan. This limited warranty does not apply to products that have been repaired (except by Modern Flames or its authorized service representatives) or otherwise altered. This warranty does further not apply to defects resulting from misuse, abuse, accident, neglect, incorrect installation, water damage, improper maintenance or handling, or operation with an incorrect power source. In stock products ship within 1-2 business days. Transit times typically vary from 1-6 business days. This product must ship LTL freight and a signature is required for delivery. Please be sure to inspect the all freight shipments carefully and note any damages or missing items on the delivery receipt. In the event of possible concealed damage, freight customers MUST write "Pending Inspection" next to their signature on the delivery receipt. Failure to write "Pending Inspection" on the delivery receipt will bar the customer from recovery for undiscovered/concealed damage, after the fact. If the product was not purchased from this webstore, please contact your retailer as we are not the manufacturer. Product was purchased from this webstore, and is NOT defective or damaged. Product was purchased from this webstore, and is defective or damaged. A warranty claim must be submitted and resolved prior to returning this item. Please note that we are an independent retailer, and NOT the manufacturer. Product was purchased from this webstore, and is experiencing warranty related issues.